My copy of Island of the Blue Dolphins looks like the one you see here. It's not my favorite cover but it was very reasonably priced at Goodwill and beggars cannot be choosers. 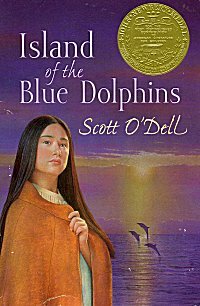 I read Island of the Blue Dolphins , by Scott O'Dell for the May edition of the Reading to Know Book Club. Amy from Hope is the Word is hosting this month's discussion and the post wherein everyone is to leave links to their thoughts on this book will post tomorrow. As I'm sure Amy will note, she didn't really choose this title. I did. She had a list of classics she wanted to read and she allowed me the pleasure to choose any from her list to read and discuss for May. I chose this one because I had never read it either. I had no idea it was based on a true story! 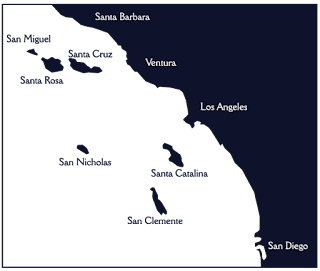 Island of the Blue Dolphins is a fictionalized account of a real life woman known as the "Lone Woman of St. Nicolas Island." In this fictionalized account, we are introduced to a young Indian girl named Karana. Karana belongs to a tribe who were massacred by a group of Alaskan hunters who had come to the Island to hunt for sea otters. Karana and a few remaining Indians are offered refuge on a ship which will take them to a new land. The tribe agrees to relocate. However, upon boarding the ship which is to take Karana to her new home, she realizes that her brother is on the Island still, accidentally left behind, and she jumps ship in order to be with him. Not wanting to spoil the story for anyone who has not read it, I won't say much from here except that this attempts to tell the story of what might have happened to the real "Lone Woman" in the 18+ years she remained on the island, waiting for rescue. Whether or not the real "Lone Woman" boarded a ship with her remaining tribesman and then jumped is a story that cannot be verified. Popular legend apparently states that this woman realized that her baby had been left on land and so she swam to shore to be with her child. However, no one can say with any degree of absolute certainty that this is indeed what happened. 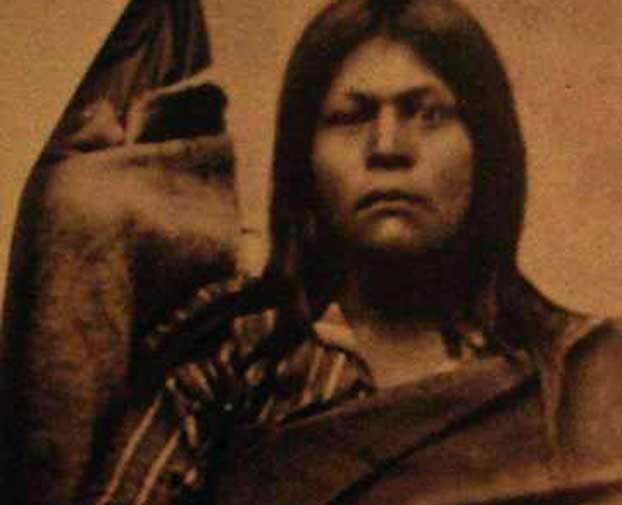 What can be confirmed is that this woman lived all alone on St. Nicolas Island for around two decades between the years 1830 and 1850. Here is a picture of that woman, who was later given the name of Juana Maria by the Catholic priest who baptized her. I thoroughly enjoyed this story. I had asked previously if I should read this aloud to Bookworm1 and a few of you suggested that might not be a great idea. I'm glad you cautioned me against it. This book deals heavily with the subject of death and while I don't think he would be affected poorly by it (nearly as much as I worry he might) I'd just as soon save this one for a few years out. It's recommended reading for grades 4 through 7. I wouldn't mind him reading it around the age of 8, I just think he ought to hold off until then. "[F]or animals and birds are like people, too, though they do not talk the same or do the same things. Without them the earth would be an unhappy place." While I do agree that without the animals the earth would be a far more unhappier place, and while I do think animals have funny quirks and behaviors which endear them to us, I do not think that they are like people. I do not personally place animals on the level of people. Yes, they have brains and use them in different ways but I do not believe animals have souls. I believe that God gave us animals to delight in and find uses for, to help ease our burdens whether they be work related or emotionally helpful (e.g., dogs as comforters and companions). So, I disagreed with the author's stance on animals - which is a major theme throughout the book - all the while being interested in O'Dell's description of the various animals and their traits. I'm very glad to not be in desperate need of having to eat one. Very fun book! So glad Amy was willing to read it. ;) I highly recommend the read and am looking forward to finding out who else read along! 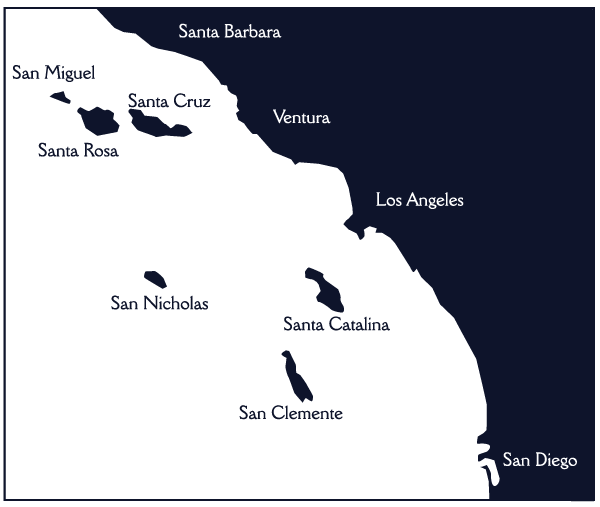 An archeologist believes that he has found the cave where the Lone Woman of St. Nicolas Island lived. "I live contented because I see the day when I want to get off this Island." Sadly, the Lone Woman lived only seven short weeks beyond her rescue. What a wonderful post, Carrie! I really enjoyed reading it. I agree with you about animals, though I must say that all the descriptions and Karana's relationships with the animals are my favorite part of the story. Thanks for all the links! I didn't have time to do a lot of exploring for my post. Sounds soooo interesting. I cannot imagine being on my own for that long. How sad that she lived for such a short time after rescue. My post will go up tomorrow, Lord willing. I actually loved the author's stance on animals(or at least the way I took his stance). I didn't take it that he thought animals have souls or that they are *actually* on the same level as us. I believe that animals are a gift from God. Killing them *just for the fun of it*, or because we want(not need) a new necklace or skirt, etc. doesn't exactly say, "Thank for Your gift", in my opinion. ;) I think more than anything the author was trying to magnify the fact that animals are beautiful, entertaining creatures that shouldn't be mistreated for human sport. I actually think to do so is sinful! *To make sure I'm not misunderstood, I don't think it's wrong to eat animals. Need vs. want is huge here. I really enjoyed this book, though! What a great post! I included the link to the cave discovery in my post too, but am glad you shared the link to the song. It was a fun little read! @Bluerose - I agree with you. I have zero issues with killing the animals that we need to eat or make things. But killing off animals just because we want to does seem, not only abusive of our roles as caretakers of the earth and its resources but also counter productive. I'm also for killing animals though that threaten human life (i.e., a rabid beast that needs to be put down before it causes harm). Humans before animals always, but care for the animals as well. I totally agree on the people coming first! Something comes at my babies(or anyone for that matter), it's a goner!! There are abalones at the aquarium here, all the starfish in the tank crowd around it and the aquarium volunteers are constantly moving the starries so they do not eat the abalone, who are, apparently, a great delicacy. I agree about animals, both what you said in the post and the comments. I didn't enjoy this quite as much as I had thought I would, and had to "make" myself push forward at times, but it was interesting. It was even more interesting to explore some of the online history. I really enjoyed your in depth review. All the great information you put out there! I am late but then I seem to be a lot lately! No I am glad I don't have to eat an abalone! yuk. That is sad about how she died soon after leaving the island. As I said before this was a big favorite from childhood, but I just found out (by reading everyone's posts) that this was based on a true story. As soon as I have a computer with sound I'm going to listen to that song, AND I wonder if there are any books written about the real woman. Like, non fiction type books. I may be in the minority here, but I could go a looong time with nothing to eat but abalone. In fact, just looking at it makes me crave seafood. This is why I don't do well in the aquarium. I read this book as a child. Probably middle school. It made a big impact on me as I could not imagine living alone all those years.